21 Quick and Easy Easter Dessert Recipes That Everyone will Adore! We have 21 of the Cutest Quick and Easy Easter Dessert Recipes that will be a huge hit this Spring. There are tons of cute Easter desserts for kids to choose from! So fun! I just love making cute kid friendly Easter desserts for class parties and family events. There are so many cute Easter themed desserts that you are going to have a hard time deciding which ones to make. Make your list and let’s get ready! I even spotted a few no bake options! The kids will have a blast helping to make these! 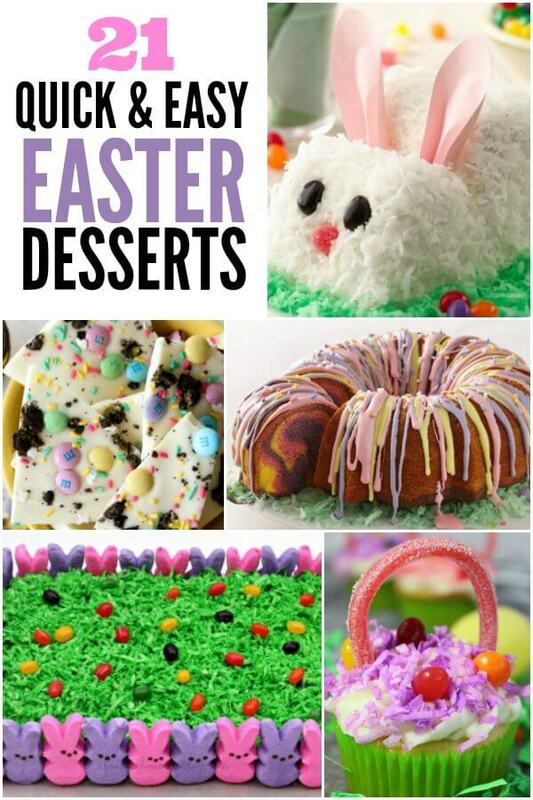 There are so many kid friendly Easter desserts to try! From class parties to family gatherings, these dessert ideas will not disappoint. There is something for everyone! We love Spring time around here! Everything starts to bloom and Easter is such a memorable time as well. If you are having an Easter party, it’s so fun to make Easter treats and pass out lots of Easter candy! One of my favorites to make is this adorable Bunny Cake. It’s always a huge hit each year. We love all these fun memory making activities. From decorating Easter eggs to making sugar cookies and other Easter goodies, we have SO much fun! Have you tried these amazing Carrot Cake Cupcakes yet? You must put them on your list to make. They are delicious! They have cream cheese frosting and adorable little carrots on them! So cute! 1. Easter Pretzel Chicks- These are adorable and just a few ingredients needed to make! These pretzel chick rods are perfect for any Easter celebration. 2. Rainbow Ring Easter Basket Cake– We love all the spring colors in this gorgeous basket cake. It looks so festive and I bet it’s yummy too. 3. Easter Kit Kat Cake– Have you seen these fun Kit Kat cakes? They make the most adorable Easter Basket cake! 4. Nutter Butter Easter Chicks– Yum! These Nutter Butter chicks are perfect for class parties! 5. Easy Easter Peeps Cake– This is a fun sheet cake using Peeps! They come in so pretty pastel colors that you can customize your cake your liking. 6. Skateboarding Bunnies- This is so cute using cookies and peeps! Kids will love this one! 7. Easter Bunny Race Cars– No Bake and kids will love these! 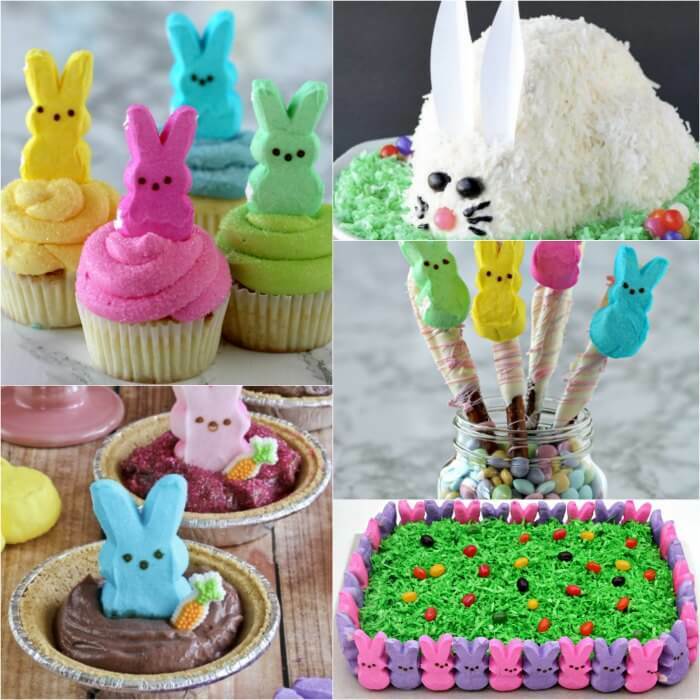 Grab some peeps and twinkies and have a blast making these fun treats. 8. Funfetti Popcorn (Bunny Bait)- This is cute if you need something for individual bags. I love the plastic bags here with bunny ears! 9. 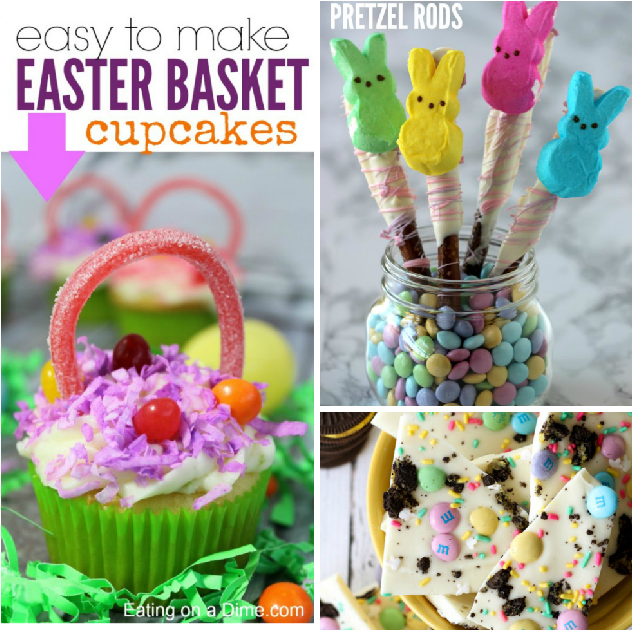 Edible Nests– Pretzel sticks make the nest and jelly beans are the eggs. This dessert is so fun and creative. 10. Flower Pretzel Bites– So easy and quick with mini pretzels. These bite size flowers are adorable. 11. Easter Bunny Cake– This cake is too cute! Everybody needs a bunny cake! 12. Easter Bunny Cupcakes-These are so fun and whimsical. The shredded coconut makes the bunnies look so cute and fluffy. 13. Krispy Easter Eggs– This dessert is frugal and cheap and so cute! It’s pretty quick to make too with rice krispies cereal. 14. Peeps Pudding Smores Pies– Individual desserts are so fun. Easter Peeps make this dessert adorable and tasty too. 15. Easter Oreo Bark– We love the pretty pastels in this tasty desert. The Easter M&M’s make it even more festive. 16. Easter Basket Cupcakes– This is a big hit every year! The candy “basket handle” is so cute and yummy too! 17. Easter Bunny Cake-This gorgeous bunny cake looks even better with a generous layer of coconut around the base to look like grass. Such a fun cake! 18. Easy Carrot Cakes Cupcakes Recipe-I love that this recipe can be used for delicious carrot muffins or for iced cupcakes. Yum! 19. How to Make Bunny Cupcakes– Easter Peeps make adorable bunny ears on this fun cupcake recipe! Kids will go crazy over this whimsical recipe. 20. Peeps Cupcakes -Everyone loves Peeps! Top these cupcakes with Easter bunny peeps to make a fun treat. 21. Peeps Chocolate Covered Pretzel Rods -This is a yummy treat if you are looking for something besides cake. These pretzel rods look so cute with chocolate and peeps! Which one of these Easy Easter Desserts will you be making first? 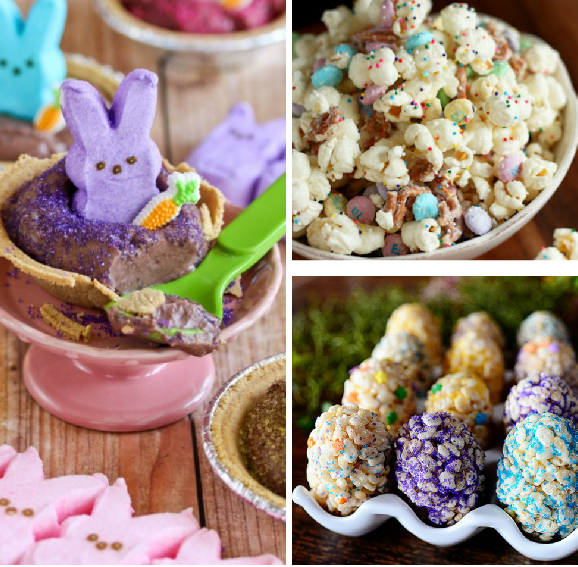 So many cute Easter desserts, you will have trouble choosing only one to make! I made a list and now I just need to get started! Some of these I plan to make for Easter Day and some I want to take for class parties and to hand out to neighbors. If you plan to make cupcakes, these cupcake carriers are so handy! You can even get one of the double or triple ones to carry even more cupcakes! They also make cake carriers too if you plan to make one of the cakes. I spotted lots of sizes for sheet cakes or layer cakes. If you are traveling with your goodies, one of these is a must! 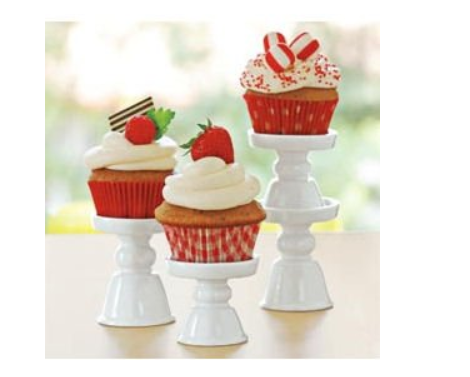 If you are hosting an Easter party or dinner, these mini cupcake stands would be so cute to display a few cupcakes. Wouldn’t those Peeps Cupcakes look amazing on these? Everyone will love these Cute Easter Desserts for Kids! These will soon become a new family tradition. The kids will ask for these Easter treats year after year. Such fun memories to make with your family every year! You might even want to make a list of goodies to make that would be perfect to hand out to neighbors and friends. The Funfetti Popcorn (Bunny Bait) would be perfect to hand out to classmate, friends and more! So fun and delicious! You can make this simple DIY Easter Egg Wreath very quickly and inexpensively. It’s a gorgeous way to decorate your home for Easter! We have over 25 Quick and Easy Easter Appetizers that are easy to make and taste amazing. We have the best Graduation Party Ideas. You will find a big list of decor ideas, party food recipes, gifts and more to make your party a success. 50 of the Best Easter Basket Stuffers That Kids will Love!